Crossing Swords is a musical retelling of Cyrano de Bergerac set in the fall of 1969, as the boys of St. Mark’s join the girls of St. Anne’s to put on a production of—you guessed it—Cyrano de Bergerac. 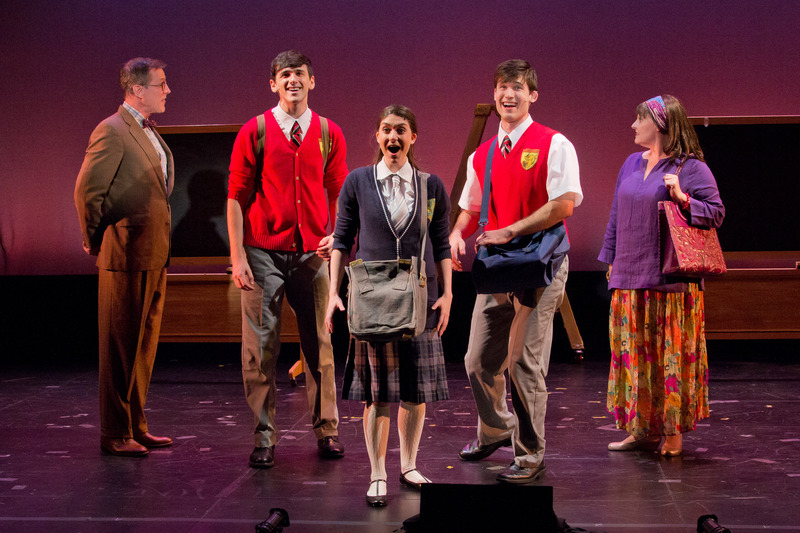 Sir (Steven Hauck), the stuffy math teacher at St. Mark’s, grudgingly chaperons his students Jeremy (Lyle Colby Mackston) and David (Marrick Smith) over to rehearsals led by Miss Daignault (Linda Balgord). Jeremy wants to play the lead, while David wants to be closer to his “Roxanne,” a girl named Nicky (Ali Gordon). Jeremy offers to be David’s “Cyrano” and help set the pair up, all while hiding his own crush on David. In the process, the teens (and teachers) learn about life, identity, and the different forms that love can take. 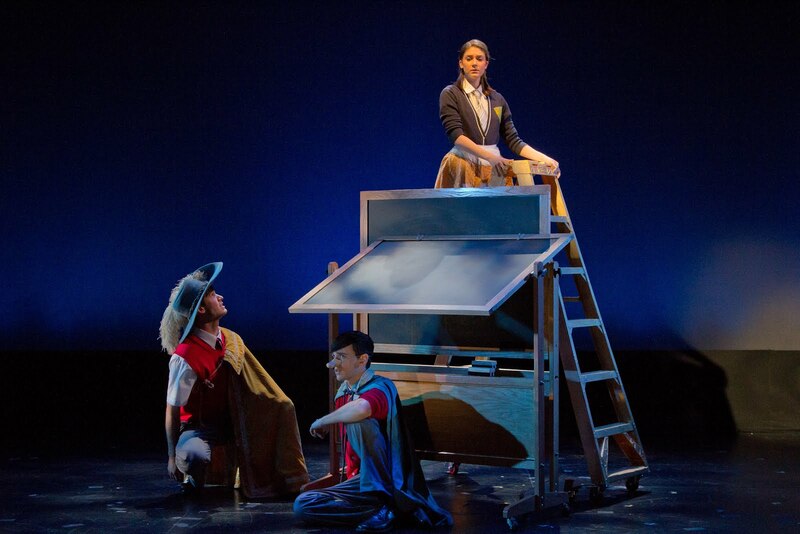 At first, I turned a skeptic eye to the Cyrano story being retold through a high school production of the play. But Crossing Swords charmed me much in the same way as the 2008 film Were the World Mine did. (Were the World Mine has a similar premise: just replace Cyrano with A Midsummer Night’s Dream.) The musical beautifully captures the awkwardness and innocence of adolescence, especially when David and Nicky practice their stage kiss for the first time. And Jeremy, David, and Nicky, despite their passions, are not the sardonic, alcohol-drinking, heavily sexualized teens that are featured in most teen-centric stories today. Their heartfelt coming-of-age story, while nostalgic, was a refreshing one to see. The teachers, too, have something special to offer, as Sir and Madame Daignault are dedicated to their students’ development, even though they clash on the exact methodology. Marrick Smith (David), Lyle Colby Mackston (Jeremy), and Ali Gordon (Nicky) in “Crossing Swords.” Photo by Seth Walters. Crossing Swords director Igor Goldin gives the production a seamless staging. He also brings wonderful performances out of the cast, who all approach their roles with naturalism and sincerity. The songs, written by Joe Slabe, have a gentle, almost pensive quality to them. The book, also written by Slabe, ties it all together with poignancy and a fair bit of humor. (One choice line, uttered by Sir: “Childhood theatrics are tantamount to child abuse.”) The piece is so well-crafted that it doesn’t need historical references to the Stonewall riots and the moon landing. Crossing Swords already takes you to a time of its own, where love can be lost—and remade—again. Steven Hauck (Sir), Lyle Colby Mackston (Jeremy), Ali Gordon (Nicky), Marrick Smith (David), and Linda Balgord (Miss Daignault) in “Crossing Swords.” Photo by Seth Walters. There’s another little orphan with red hair and a similar name singing and dancing in a show a few blocks northeast of the PTC Performance Space. But Bend in the Road‘s source material isn’t a comic strip. Instead, writers Benita Scheckel (book & lyrics) and Michael Upward (music & lyrics) take on the classic children’s book series Anne of Green Gables. Bend in the Road follows Anne Shirley, an orphan who is adopted by middle-aged siblings Matthew and Marilla Cuthbert. The Cuthberts had expected a boy to help them on the farm, but Anne captivates the pair. While living with the Cuthberts, Anne gets in (and out) of scrapes, makes friends in the town, and finds her place in the world. I loved reading about Anne Shirley and her adventures in Prince Edward Island as a child, and equally I loved seeing Lucy Maud Montgomery’s characters being brought to life. Anne Kanengeiser and Martin Vidnovic bring a wonderful sensibility to Marilla and Matthew, and the fourteen-person cast all handle their parts with great aplomb. 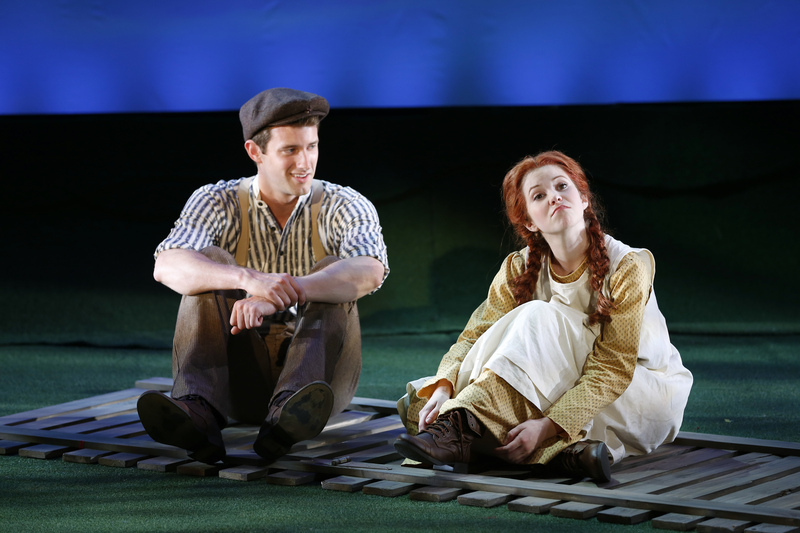 But a musical about Anne of Green Gables needs a strong Anne, and Bend in the Road has found it in Alison Woods, who carries the show on her small (but very capable shoulders). Woods, who resembles a younger Amy Adams in her speech (and overall adorableness), plays Anne as a real child and not as a caricature, while still imbuing her with a great deal of energy and precociousness. 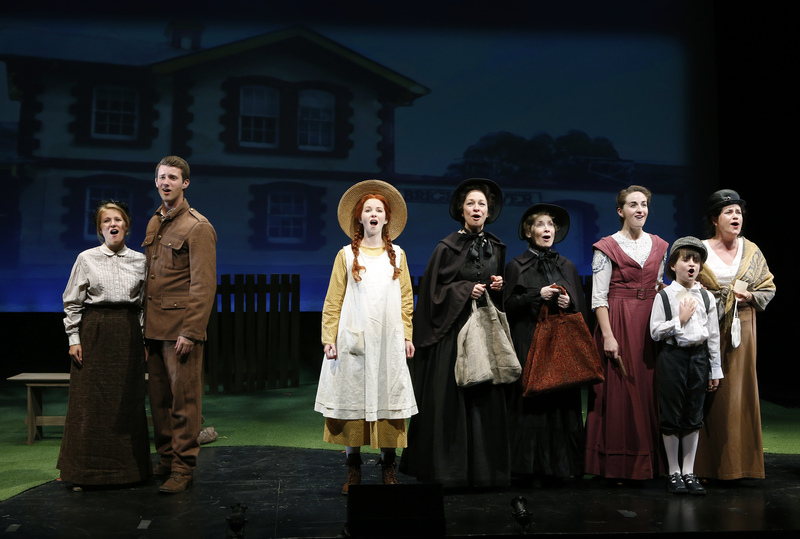 Michael Upward’s music captures the timeless essence of Anne of Green Gables in the tradition of “literary” musicals like The Secret Garden and Little Women. The lilting harmonies transport you to the countryside of Prince Edward Island and are a delight to listen to. I hope that Bend in the Road will continue to have audiences of all ages in future productions. Favorite songs: “The Lord’s Prayer,” a song between Anne and Marilla that instantly put a smile to my face, and “Walk Like Sisters,” a duet between Anne and her friend Diana.